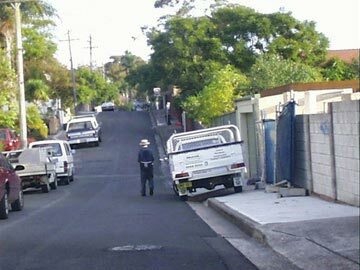 The Chairman of the Pedestrian Council of Australia, Mr Harold Scruby, has called on the NSW Government to take urgent action regarding the outdated Penalties, Regulations and Enforcement of the footpath parking laws, which act to seriously compromise the safety, amenity, access and health of pedestrians. 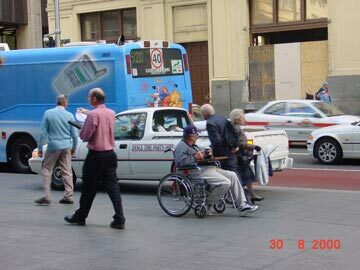 Mr Scruby said: "The Auditor-General's Report on Street Parking Enforcement has now been gathering dust for over 2 years. It is a damning indictment of ancient work-practices and anomalous and contradictory laws, regulations and penalties. The A-G found: " Some laws, or penalties under the law, seem to be at odds with the perceived objectives of the law. For example, the severity of penalties for certain offences which involve pedestrian safety (for example parking a motor vehicle on the footpath, which is potentially dangerous) attracts the same penalty as exceeding the permissible parking time, that is $63. Also dangerous parking, unlike dangerous driving, attracts no demerit points (from a driver's licence. Yet to date, nothing has been done to improve the rights of pedestrians. .... "
SOME parking fines are so low they no longer act as a deterrent, according to a senior police officer. City police parking patrol co-ordinator Jan Whalan said some motorists were willing to park illegally and pay fines for the convenience of driving in Sydney's central business district. For example, a motorist who parks illegally on a footpath in the city faces a fine of only $63, which executives can write off as a business expense. 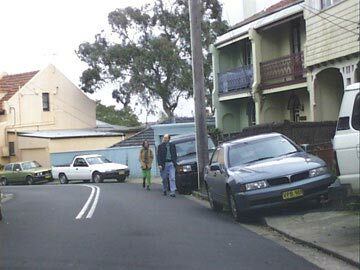 In a letter to the Pedestrian Council of Australia, Ms Whalan said: "As much as the parking police enforce this, it has little impact on the motorist as the offence carries such a low penalty of only $63. "The penalty is of no deterrent, and to quote one motorist's own words, 'Go ahead and book me, it's cheaper here'. 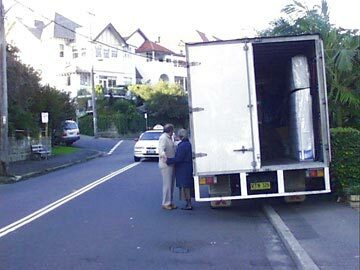 "The parking police find this very frustrating. Under the current legislation we are only allowed to issue the vehicle with one infringement per day unless the vehicle or the offence changes. "Currently we have no authority to arrange for a tow of the vehicle as this only applies to clearways and bus lanes." Mr Scruby added: "The Government must act now. A picture is worth a thousand words. 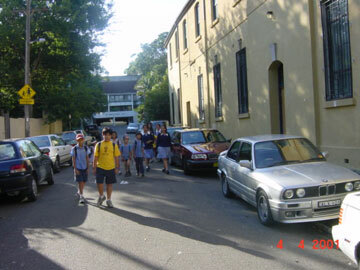 The photos below prove our points and demand immediate action from the responsible politicians and authorities"
" WALKING FOR HEALTH "
PARKING offenders should be hit with higher fines and docked licence points under a submission from NSW councils. Local government also wants to take control of handing out infringements across the State. The Local Government Association (LGA) last week lodged a submission with the State Government, which is conducting a review of parking enforcement. An Auditor-General�s report released in November found that the State Government�s parking police, who began operating in 1945, were inefficient. The report found that the 320 State parking officers issued 50 per cent fewer tickets per officer than 40 years ago and took among the highest number of sick days of any public sector employees. The LGA submission also calls for increased penalties for parking across a driveway, which carries a $61 fine, and for heavy trucks in local streets, now a $68 fine. now $200, and on footpaths, now $60, as well as a new offence for leaving trailer bogies on public roads, should be introduced, it said. Pedestrian Council of Australia chairman Harold Scruby welcomed the LGA�s submission, saying police resources should be freed to investigate criminals. 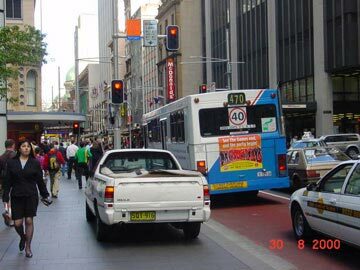 �Every taxi driver in Sydney knows they will not be booked for parking illegally, they will just be warned,� he said. �The parking police do not want confrontation.